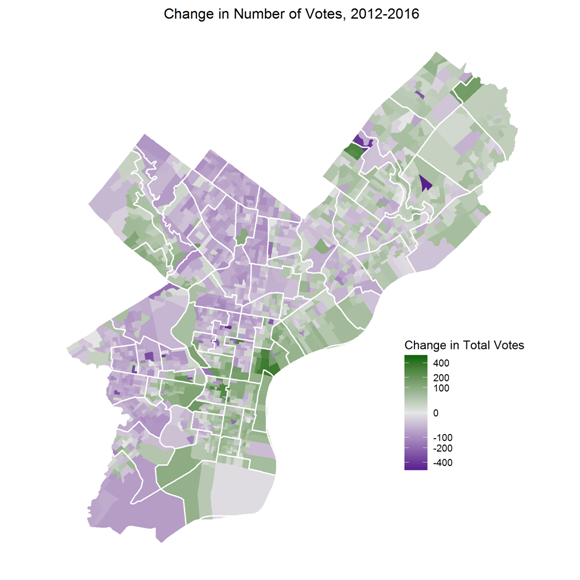 How Philadelphia Neighborhoods Voted | Econsult Solutions, Inc.
We are now a week removed from the 2016 Presidential election, with an outcome that surprised a lot of poll watchers (though perhaps we should have been less surprised). Much of the pre-election talk was about Pennsylvania as a swing state, and Philadelphia specifically, as the democratic bastion that could carry the state. Well, how did Philadelphia vote? I downloaded some results from http://phillyelectionresults.com/ to find out. Hillary Clinton dominated the Philadelphia vote, winning 82.2% of the vote to Donald Trump’s 15.5%. However, that percentage is down from 2016, when Barack Obama won 85.2% of the vote, to Mitt Romney’s 14.0%. That three percentage point drop in support for the Democrat was a muted version of the drop in the state as a whole: Clinton had 47.7% of the Pennsylvania vote to Trump’s 48.8%, compared to Obama’s 52.1% to Romney’s 46.7% in 2012. Much of the city is a dark blue, representing strong support for Clinton. These occur predominantly in West and North Philly, and parallel her strong support among Black and Latino voters nationally. 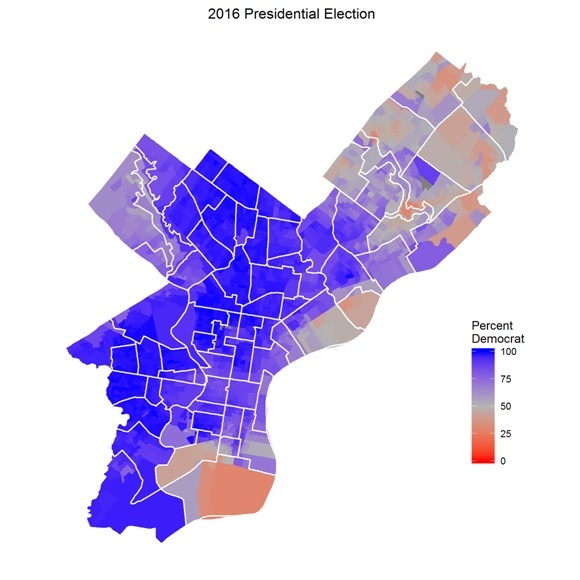 The lighter blue in the center of the map represents Center City, which predominantly supported Clinton, though not in the high 90 percents of the surrounding neighborhoods. Deep South Philly and the Far Northeast are Trump country—or at least Philadelphia’s version of it. These regions are almost evenly split between the two candidates, with far more support for Trump than the rest of the city. Of course, the map in 2016 looked broadly similar to the map in 2012. Small changes in support can mean the difference from an Obama blowout in 2012 to a narrow Trump win in 2016. Figure 2 shows the division-by-division change in the percent of the two-party vote that went to the democrat from 2012 to 2016. 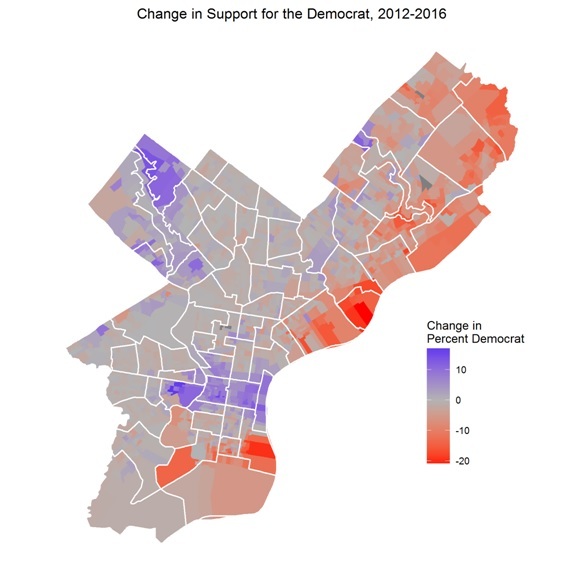 The Black and Latino neighborhoods in West and North Philly saw essentially no change in support for the democrat from 2012 to 2016; these neighborhoods were already entirely Democratic, and remained so. Center City, on the other hand, saw a significant shift Blue; there were a number of Romney voters here in 2012, but these Never Trumpers moved to Clinton in 2016. Counterbalancing this move was South and Northeast Philly: these neighborhoods were already more Republican than the rest of the city, but swung towards Trump in a way that they hadn’t for Romney. Of course, percentages of votes are only half the story. The other half is turnout. Figure 3 maps the change in the total number of votes in each division. We see that in West and North Philly, those Black and Latino democratic strongholds, turnout was down across the board in 2016. On the other hand, turnout in Center City, University City, Manayunk, Fishtown, South Philly, Fishtown, and the Northeast, was all up. 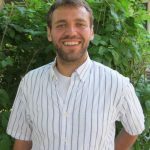 Let’s pull in some data on the neighborhoods themselves. 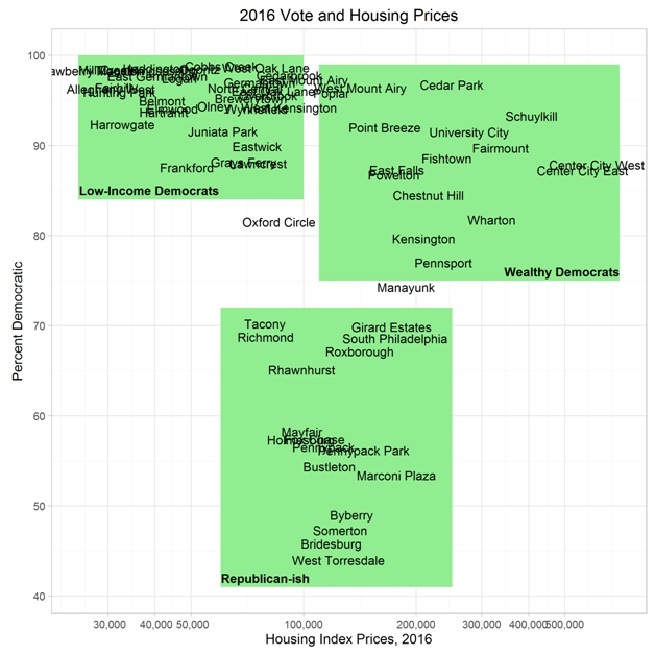 Figure 4 plots the percentage Democrat of the two-party vote versus the neighborhood’s Housing Price Index. Using sophisticated “Draw Rectangles Around Things” technology, we see three basic groups of neighborhoods in Philadelphia. The neighborhoods in the top left of the plot are low-income neighborhoods with huge Democratic support; these are the West and North Philly neighborhoods that are dark blues in Figure 1. It can be hard to make out the neighborhoods in the jumble, but these include Cobbs Creek, Strawberry Mansion, East Germantown, and Hunting Park. To the top right, we see the “Liberal Elites”, the wealthy neighborhoods that vote predominantly Democratic, but with more political diversity than the lower-income counterparts. These neighborhoods include Cedar Park, Chestnut Hill, Fishtown, Fairmount, and the Center Cities. In the bottom, we see Philadelphia’s version of Republican neighborhoods. These neighborhoods voted for Clinton at rates between 40 and 70%, generally higher than the state as a whole (and still mostly more Democratic than Republican), but lower than the rest of the city. These include neighborhoods in South Philly—Girard Estates, South Philadelphia—and also neighborhoods in the Northeast—Bustleton, Pennypack, Byberry. The change in support tells a similarly three-category story. Figure 5 shows the same neighborhoods plotted for the change in the percentage Democrat of the two-party vote from 2012 to 2016. We see that the low-income neighborhoods are all clustered slightly below zero, these neighborhoods voted at nearly 100% rates for Obama in 2012; that rate dropped for Clinton, but not by much. 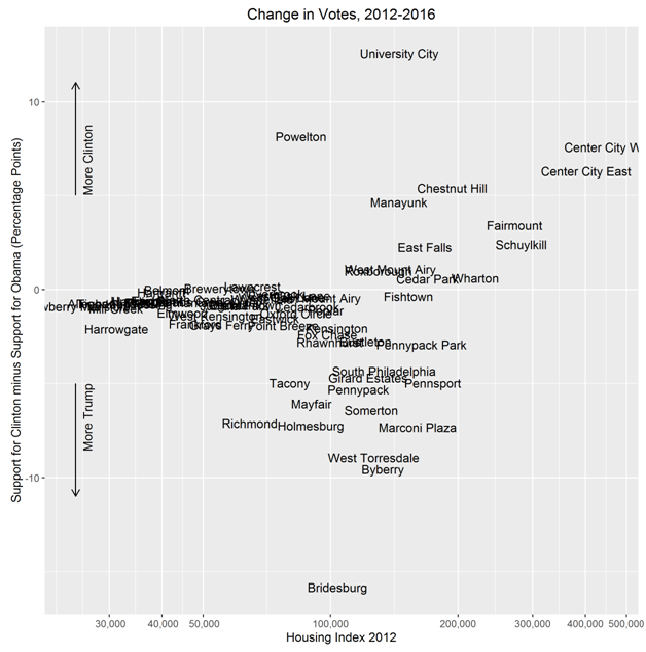 The top right are wealthy neighborhoods that voted much more for Clinton than for Obama. These neighborhoods were more politically diverse already, but the Republican voters from 2012 proved to be Never Trumpers in 2016. In the bottom center of the plot we see the middle-income neighborhoods that were our Republican-ish group in Figure 4; these neighborhoods, though already disproportionately Republican, voted much more in favor of Trump than they had for Romney. 2016 Pennsylvania results are as of November 12, with 99.93% of precincts reporting. Six districts in the state still haven’t reported. Comments, Questions, Ideas? Let us know!